Color is an integral part of your home decoration, as the colors you chose to associate yourself with at home, could and most often would influence how your mood is going to be for the foreseeable future. Studies have shown that, people who associate themselves with darker colors in and around their homes, are more likely to have darker personalities, and darker moods, while people with brighter colors in and around their homes, are more likely to have brighter personalities, and brighter moods. There have also been other studies that have shown that, associating yourself with darker colors could lead to depression. As you can see, the choice of colors for your home décor is an important part of your life. One sure method of not associating yourself with one particular color is to have multiple colors in and around your home. The more colorful, the better, as most of us would agree, we prefer things to be colorful in our lives, and thus this will bring more color to our personalities and moods. When you talk about colorful, there is nothing more talked about, than a rainbow, as a rainbow is the symbol of being colorful. So here are 10 awesome ideas in adding rainbow colors to your home decor. When it comes to colorful, butterflies are pretty much synonymous with being colorful, and your brain recognizes that. So a very simple and cost effective way of introducing rainbow colors to your home décor is to cut out shapes of butterflies in rainbow colored papers, and paste them on a wall. This also makes a wonderful home decoration as well as a mood fixer. This is another idea that would take a little idea, but it is really effective. Instead of painting an entire wall in one color and the other wall in another color, it is a better idea to paint small portions of the wall in different colors; this makes a wonderful piece of art, and serves the purpose perfectly. 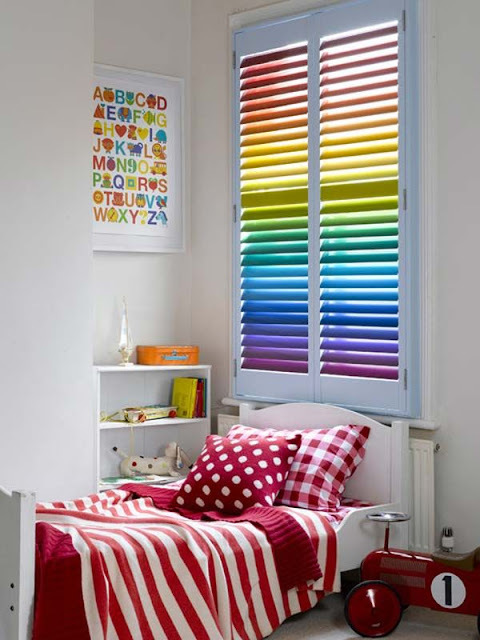 This may cost a little more than the other ideas in this list, but it makes a wonderful addition to your room, as a multicolored curtain would simply eliminate the need for you to get your hands dirty, like when you have to paint a wall by yourself, but a curtain would essentially do the same thing. This just like curtains, perform the same task as a multicolored wall, but more subtly than how a curtain would do it, as no one really reads too much into a multicolored rug as opposed to a multicolored curtain. This method may be the most costly way of achieving colorfulness, but this is the most subtle way as well, as it just looks good when you have a lot of artwork around the house, and people will think you are just an art lover. The kitchen is widely considered the heart of any home, so having a colorful kitchen is very important. One interesting way of doing this, is to have rainbow colored pantry cupboards, this adds an interesting dynamic to the kitchen and at the same time is a nice conversational topic with your guests. This is yet another simple DIY task, where you could just draw colorful word arts of interesting quotes, or of strong impact words and frame them to hang up around your home. Using pots and pans are an integral part of our daily cooking routine, so why not add some spice to that with some color, thus instantly putting you in a good mood when you cook. 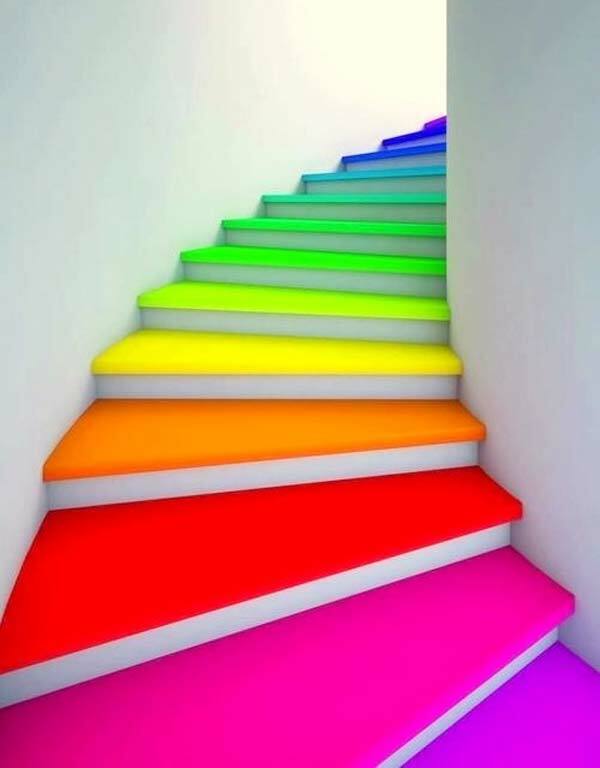 This may seem a little childish, but this actually works as well as a multicolored wall, as gives you a really nice feeling of walking across a rainbow. This is something so simple, that most people already do it, but they have no idea of the effect it has on their lives. Be it whether it is just to read a book, or watch television, or just a quick nap, a sofa is a really good option for all of those, and spicing up your sofa, with colorful cushion covers or just arm cushions, is a really easy way to fix any mood. As you can see, the incorporation of rainbow colors in your home décor can go a long way in how your mood is, and how happy you are in life generally. So use these steps to spice up your home in such a way that it would be a positive influence in your life.